This album spread includes two candid photos at this Black Creek Pioneer Village wedding. The bride and groom chose this particular venue because they loved a rustic wedding and after a few visits to other establishments they decided on this wedding venue. A few features of the village tipped the scale. First, the bride and groom loved the wedding chapel where they eventually got married. Second, the establishment has a huge dance floor and that was a must-have for their wedding reception. Even more, because they got married here they didn't need a permit for the photo session. Last but not least, because of a large number of guests, the couple realized at a banquet hall parking might be a problem. Also, beautiful bride wanted a rustic wedding and that the he story buildings in the village made them choose this place. To give you more context, I captured both images during the bride's preparation on her special day. Also, in both images, I was only documenting the action without interfering with the scene. Often, on the big day, I love just observing the events and immortalizing the most beautiful moments. 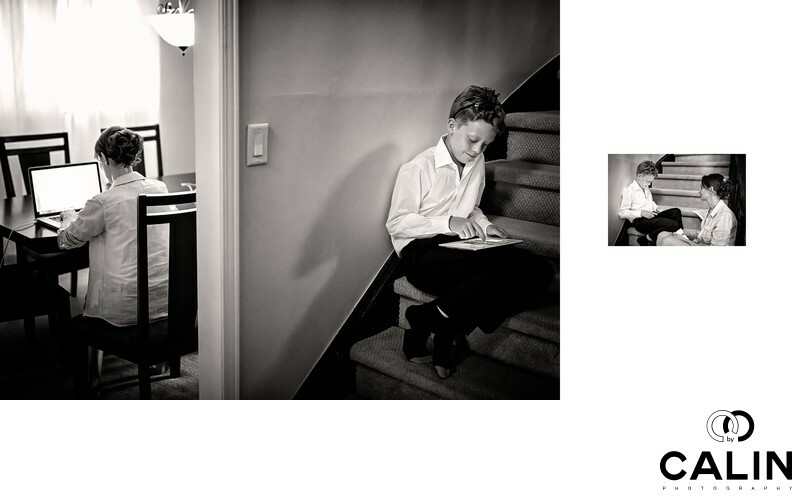 The photo on the left taken early on the wedding day before the wedding ceremony, shows the bride sitting at a table in her house in downtown Toronto and writing her vows. In the meantime the bridal party and a few guests were enjoying a few glasses of champagne in the kitchen. A few elements make this image stand out. First, the room is dark and the light from the laptop is illuminating her face. Second, she does not seem to hear anyone. She is that focused! Third, the image tells two stories in one shot. On the left half of the image, we can see the bride, while her son is on the right half of it. He is also absorbed in a different kind of activity: gaming! Both were so focused that they did not even notice me taking photos. That is what I call photojournalism at its best! The image on the right shows the bride and her son talking. I took the shot seconds after she finished writing her vows. After the bride printed her vows, she spent some time with her son. For this album page, I chose a black and white processing.